Description: Welcome to one of the best Minecraft adventure game – Mine Blocks! This game is a version from the Mine Blocks series. 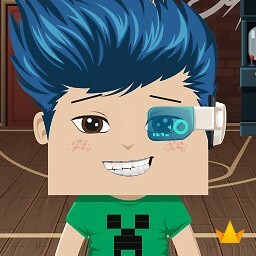 Author of the game is Zanzlanz who is a loyal Minecraft fan. Play as a middle-aged Minecraft guy! He is at the center of the 2D Minecraft land. He wants to build a castle in this world. Help him now! The first step is collecting many resources like sapling, bamboo, wood, red flowers, sugarcane, gravel, yellow flowers, leather, white cloth, raw porkchop, mushroom, and more. The next step is using them to craft something as sticks, wooden planks, crafting table, etc. This version 1.19.4_5 has some new points such as store, kill monsters for XP, sneaking (press down key), fixed more bugs, added moon, added water currents, added sun and others. Instructions: Discover Mine Block game with the mouse. How do i place things lol!